Alliene Luckenbaugh Johnson died peacefully on Oct. 8, 2018, ending a life that spanned 95 fabulous years. A native of Spring Grove, Pa., she was born on April 7, 1923, to Allen and Fannie Luckenbaugh. She was oldest of six children growing up on a working farm, so she assumed care giving duties for her siblings early on, balanced with her daily farm chores. Her formative years on the farm taught her an abiding care for the land, animals and the natural environment that she would carry throughout her entire life. As one of her sisters noted, it was a time before climate change, so Alliene often found herself ice skating to work during winter months. 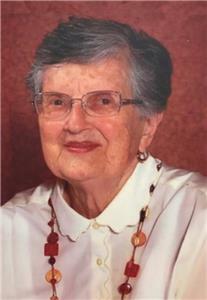 She graduated from York High School and Prowell’s Business School and took a job at Gladfelter Paper Company, where she caught the eye of a young WWII Marine Corps veteran who wanted to “meet the girl who ice-skated to work.” Her courtship with Jim Johnson resulted in a marriage that lasted 63 years until his death in 2011. Their early years took them from Pennsylvania to Minnesota, and then to Idaho before settling in Calhoun, Tenn., where she raised six children while volunteering for the Moccasin Bend Girl Scout Council, the Calhoun PTA, and helping to establish the Lutheran Women’s Missionary League (LWML) at the First Lutheran Church in Cleveland. She also worked with Head Start families to determine their eligibility for federal benefits, as a social services aide for McMinn County Community Action, a kindergarten aide in the Cleveland City public schools, and as a medical secretary. She was proud of her six years of service on the board of Keep McMinn County Beautiful. Between day jobs and carpools, she loved knitting, sewing, and working in her many gardens, an astonishing display of flowers and vegetables, and her dining room table was always a cornucopia of dishes crafted from family and original recipes - soups, salads, pies and cakes - that pleased young and old alike. But nothing elicited a more universal response than her chocolate chip cookies, and she never arrived on a grandchild’s doorstep without a container of them. She was preceded in death by her parents and two sons, Jeffrey Alan and Michael Dwight Johnson; but she is survived by three sisters: Anna Marie Strine (Dale), Maybelle Altland (John), Joyce Stambaugh (Carlton); two brothers, Bob (Gladys) and Doyle (Marian); son David Johnson, daughters Kristine, Linnea McClellan (James), and Barbara Kennedy (Jim); grandchildren Daniel, Jake and Kristopher Kennedy; Jordan and Savannah Johnson and Hayley Burnett (Trevor); Candice Sexton; and two great grandchildren, Cody Moser and Kaycee Sexton. The family would like to acknowledge the care she received from the staff at Alexian Brothers Valley Residence and Hearth Hospice as well as the warm friendship and support of Sue Beatty with Choices in Senior Care. Services will take place Friday, Oct. 12 at 3 p.m. at First Lutheran Church in Cleveland, with a private burial to follow at Sunset Memorial Gardens. In lieu of flowers, please consider contributions to the LWML of First Lutheran Church in Cleveland, the Chattanooga Nature Center, or Keep McMinn County Beautiful. We invite you to send a message of condolence and view the Johnson family guestbook at www.fikefh.com.